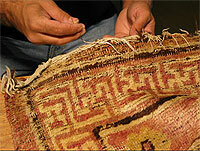 Antique Rug Company provides professional Oriental rug cleaning services for all cities in San Fernando Valley. The methods of cleaning handmade area, Persian, Navajo and Oriental rugs are generally similar but vary in specific details. Here at Antique Rug Company, we use the proper method suitable for the rug at hand which caters to the particular needs of each individual rug. Among issues to consider are condition, pile fiber content, dyes, foundation type and weaving type of the rug. Our vast experience ensures a proper servicing of your valuable rugs each and every time. Please feel free to contact us with any specific concerns you may have. Over the years, we have successfully remedied all kinds of stains, including pet accidents, dye bleeds and water and moisture damage. Your Oriental rug is a valuable investment. With proper care, it will provide you with generations of use and enjoyment. Our expert Oriental rug cleaning services are aimed at meeting the needs of each individual rug we care for. We do our best to protect, preserve and enhance the investment in your valuable rug. We offer pick-up and delivery for all cities in San Fernando Valley.